Burnley boss Sean Dyche opted for a change of tact against champions-elect Manchester City following a couple of defeats at the Etihad Stadium. The Clarets were beaten 3-0 in the Premier League by Pep Guardiola’s side before exiting the FA Cup with a 4-1 loss last month having led at the interval. The Turf Moor chief introduced a 4-4-2 formation, partnering Sam Vokes with Ashley Barnes in attack, while also handing Aaron Lennon his full debut. And the gamble paid dividends as Johann Berg Gudmundsson snatched a point for the hosts late on when guiding substitute Matt Lowton’s delivery beyond Ederson. “It’s a very good point,” said Dyche. “We have lost to these twice and done quite well in the games. “We had to change something and went to two up front. We wanted to go long and strong and play into their backline. “It didn’t really work first half, I don’t think the quality going into our strikers and from wide areas was anywhere near good enough to be really effective, although we had a great chance from a set-piece. Dyche felt that the turning point came around Raheem Sterling’s glaring miss as the English international diverted Kyle Walker’s assist wide of the post with the goal gaping. That let the home side off the hook, though Lennon was denied his first goal for the club minutes earlier when City’s Brazilian stopper, formerly of Benfica, pushed his effort on to the woodwork. Dyche said: “Second half, they came out and controlled it in the first 15 minutes. You’ve got to be diligent and do all the ugly stuff, which our players are willing to do. “Then we grew into the game. Their keeper makes an unbelievable save and then there is an unbelievable miss. “That changed the feeling, the stadium erupted, everyone came with us. “It was just on the turn before that, five minutes before that we were finding a bit more calmness. We had settled into the game and we became a little bit more assured. It was the second time in as many games that Burnley had battled back to claim a point in the final 10 minutes of a fixture, adding to that record at St James’ Park midweek. This time, however, the Clarets did it on just 29% possession which, Dyche believes, was to be expected against opposition of City’s calibre. 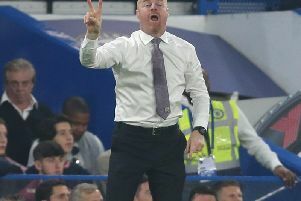 “It was a strange kind of game, which you can have against these because they’re so dominant with the ball, but I am very pleased to come through it with a point,” Dyche said. “We started getting a bit of pressure on their back four and all of a sudden they weren’t playing it as easily or as calmly. Dyche was pleased to see his players stick to their guns despite Ederson making life hard work for them. The 24-year-old plays like an outfield player at times and it’s his positioning, as well as his impressive range of passing, that enables City to make the pitch seem bigger. He said: “You have no choice against them. Every player on the pitch has to work defensively. “I don’t think there is any team, certainly not outside the top six, who cannot afford it because they keep the ball so well. “The keeper is so calm so you can’t press everyone, so if you press him and he plays out to a centre half and once they’re playing it’s difficult, the pitch becomes big because they make it big. “When you think you’ve got them sometimes they hit the big diagonal. I don’t think they did that as much last season, I think they constantly played, now they will play longer when they have to. Dyche added: “I couldn’t believe the keeper nearly got it (Gudmundsson’s goal). I thought “my goodness, he is going to save that as well.” He is the calmest keeper I have seen. It is like having Ronald Koeman in goal. “He gets it and spins it around the pitch all over the place, that adds to their gameplan massively because he defuses the game. “He made two good saves, at least a good save from Ben Mee and a fantastic save from Aaron Lennon because he has hit it so clean, that’s an unbelievable save.